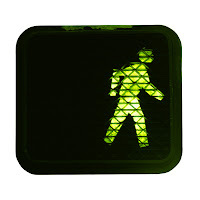 When crossing the street and seeing one of the standard walk signs (such as the one to the left), I have a habit of imitating the sign and saying "white man walking". 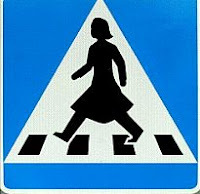 Well, Sweden is now crossing the gender barrier with their new signs. Where this will lead, I'm not sure. Non-caucasians? Dogs? Cats? It does make me wonder, if the signs are specific, is Sweden now implying that where this sign is posted, only women are allowed to walk? This entry was posted on 8:10 AM You can follow any responses to this entry through the RSS 2.0 feed. You can leave a response, or trackback from your own site.